It’s Not About Perfect. It’s About Better. I receive several requests a week from companies telling me how much they think my readers would love to hear about their fabulous (their words, not mine) products. Some even offer to pay me. I turn them all down. As someone with a passion for zero waste, plastic-free living and minimalism, I believe in practicing what I preach. I’m not interested in plastic-packaged anything, or overseas shipping, or “stuff” in general, and I’m pretty sure you’re not interested in me spruiking it, either. I’m proud that I keep this website advertisement-free, and I don’t intend to change that by running sponsored content. But a few weeks ago I received this email, and it made me look twice. I am writing from our company Tipsy Oil. We are the world’s first company to collect, wash and reuse wine bottles for bottling our Western Australian grown extra virgin olive oil. Recycling the bottles actually costs more currently than buying brand new bottle but we’re not a company that aims to become a cash cow! Additional to this, obviously one bottle of olive oil in a recycled bottle won’t save the world, but Tipsy definitely makes consumers slightly more aware about recycling. 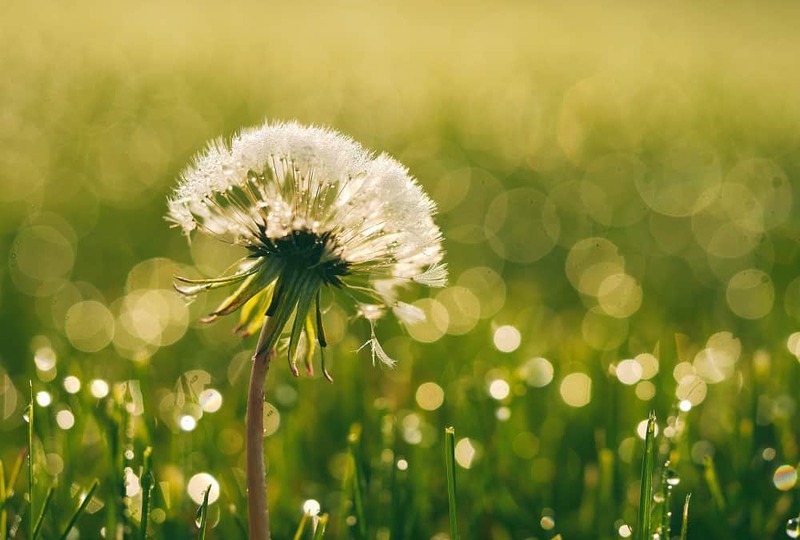 As a very young company, we are hoping to engage writers like yourself to review or post about our vision to gain a greater awareness of our product and ultimately help with the problem of pollution. Secondly, I love that they are a Western Australian company (based only a few suburbs away from me), making Western Australian olive oil using Western Australian grown olives. It makes no sense to me that shops here continue to sell Italian and Greek olive oil when we produce our own oil in Australia. Nothing against Italian and Greek olive oil of course – if I lived in Italy or Greece that is what I would use! But why ship bottles of oil across the globe when we already have it here? I also love the fact that they say “one bottle of oil in a recycled bottle won’t save the world, but…”. I think lots of companies DO think that their product will save the world, and I found this quite refreshing. As for the “but…” – to me, this says we know we’re not perfect, but we’re doing what we can. But of course – I was suspicious ; ) I’ve learned the hard way that just because somebody says their product is green, that doesn’t mean that it is! I emailed back. Where were they sourcing these bottles? Can customers return the bottles for refills or re-use? Returning the used olive oil bottles is an excellent idea and something that I just added to our Tipsy Trello board! Thanks so much for the idea! The recycled bottles are currently sourced from Gargarno’s restaurant in Nedlands, Perth, WA. As we grow bigger and start gathering bottles from other restaurants, we hope to have a special label for each restaurant to show where the bottles came from. But right now there is still so much to organise! I absolutely agree with your comments around plastic, and as we mature as a business we hope to move to 100% recycled goods. However, I am sure you can imagine the difficulties with even getting a product to the market! To give you some back story, I started Tipsy back in 2014 at the ripe age of 23 with the vision of creating a fully recycled bottle company with staff that loved the company and at the same time work with local companies instead of mega corporations. Now 25, I realise that it’s a lot harder than just writing the idea down on a piece of paper. We’ve run into things like bureaucracy, labels that absorb oil, Anthracnose, and printers that don’t know where the centre of the label is. So I hope you can give us some time to get out recycled act together! Also, just got a really great idea about using metal caps for Tipsy Bottles just then! In fact, we had such a great email conversation afterwards that we’re planning to meet soon to talk about all things sustainability. I like their vision, their openness, their transparency – and their willingness to hear new ideas. No plastic packaging (the envelope is 100% paper, including the padding) but it came with a pourer in a plastic bag! 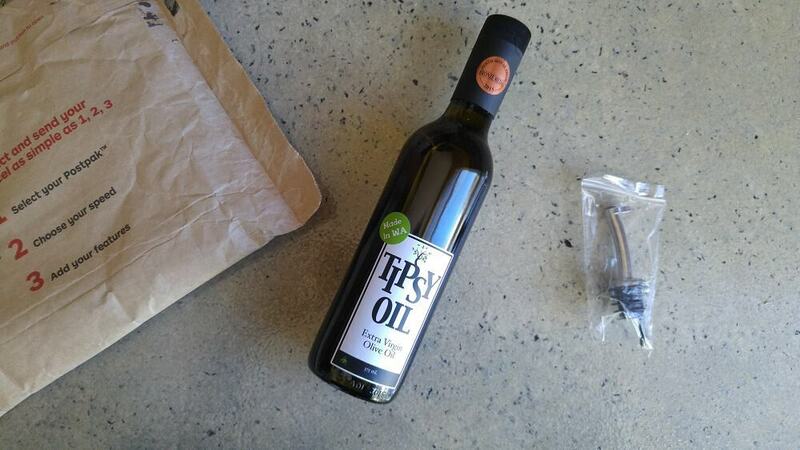 The bottle has a plastic lid, but Tipsy Oil are looking into replacing the plastic with metal in future. The padded envelope is filled with recycled paper, so plastic-free. I hope that this is how they will choose to send other products in future. As for the pourer, I would say it is unnecessary, but I have been meaning to get one since the bottle lid on refillable macadamia oil bottle split into two. Still, I’m not sure they should send them as standard. The small plastic bag?! Gah! The bottle lid itself is plastic – I hope as a result of our conversation this is something that is going to change. I also get that not everyone has access to a bulk store, and not all bulk stores sell olive oil. There need to be alternatives. What excited me about Tipsy Oil was the reminder it gave me that there are companies out there trying to do the right thing, and create positive change. It is important to start where people are at. I could wax lyrical about how great picking my own olives is, or how wonderful my local bulk store is, but for many of you, that would not be helpful. All of us are on different journeys, and have different amounts of time, energy and patience available. We may not be able to buy in bulk or pick our own, but we can all look for local suppliers, businesses and stores who are trying to do the right thing. We can all ask questions and make conscious choices. And we can all champion the people and companies we find who are trying to do the right thing. Whether we need what they are selling/would use it ourselves or not, I think there is an importance in spreading the word of those trying to make the world a better place. Had I not had the conversation with Tipsy Oil, they might not have thought about switching their lids from plastic to metal. They might not have thought about looking into a bottle return scheme for customers. These are small things, but they still have an impact. It all makes a difference. Who is to say that other companies will see what these guys are doing and feel inspired to take action themselves? Actions are like ripples, and we have more influence than we think. Simply asking questions, providing feedback, or even having a chat with the lady at the checkout about the choices we make all have the ability to spark change. Never underestimate the influence you have, nor your power to make a difference. It’s not about perfect. It’s about doing what we can. I truly wish that bulk stores were an option for everybody, but the reality is, they aren’t. Instead of thinking that because we can’t do everything, there is no point in doing anything: we should all do what we can. Imagine if every single person on the planet committed to reducing their waste by just 10%? Think of the impact that would have! Imagine if all of the people in Perth who don’t have access to bulk stores chose to purchase locally produced olive oil in re-used bottles – think of the carbon emissions and virgin glass we could save! In my version of a perfect world, we would all shop at bulk stores, there would be no single use packaging, and the world would be a lovelier place. I definitely believe that this is something we can work towards: we can strive for perfection, but we also need to be realistic. Let’s not let perfection stand in the way of better. Let’s start where people are at. Let’s make better choices ourselves, start conversations and begin new dialogues, and support those that try to make a difference. It’s not about being perfect. It’s about doing what we can. Now it’s your turn to tell me what you think! Is there anything you have struggled with because it is not “perfect”? Do you ever feel disheartened because you can’t do everything? Have you made compromises that are still better than your old choices, and if so what are they? Have you found local suppliers to champion or begun to ask questions and start conversations? Have you ever had a company change its policy or look into changing it simply because of something you said, or wrote, or suggested? Have you ever stopped supporting a company you previously loved because they were NOT open to change? Have you ever let “perfect” stand in the way of “better”? Do you have any other thoughts, questions or snippets of wisdom to add? I love hearing from you so please leave me a comment below! 40 Comments • Leave a comment! ← Can You Live Plastic-Free without Bulk Stores? 40 Responses to It’s Not About Perfect. It’s About Better. I so admire you passion and commitment! This is my first plastic free July and I’m only realising now just how much plastic I use daily, today I got a drink at a cafe and forgot to ask for no straw, I also bought some shopping and didn’t even think of the plastic bag till I got home! To be honest I’m finding it a bit overwhelming but I’ve made small changes and will continue make more, I hope in a few years I’m where you’re at now. Lindsay, what an exceelnt post! I really appreciate that there is nil advertising on your page, so thank you for not going the way of most if not all bloggers, vloggers, IG-ers, etc…who are also in it to make a quid….You rock! Irs so unusual not to crumble to the mighty dollar, hats off to you, your partner, your growing-expanding and expansive community of support. and I wonder if they have thoughtof using cellophane rather than plakky; if they really have to send the nozzle, (nice gift if you need it!) in packaging for regs. Thanx for all your disseminating of info, and dedication. Thanks Sue-lee! I sometimes wonder if anyone notices that there are no adverts – it is a deliberate decision! I just feel that it would be wrong to talk about buying less and using what we have and then have adverts all over the place. I’d rather not see ads myself (and yes, I use Adblock too – best thing ever!) so it isn’t right to have them here. I think reusing is so important, and whilst it is great for us as individuals to bring our own and re-use, if companies get on board then the impact will be so much bigger! I’ going to ask about the pourer. I’ve decided to give it back. I do need one, but the one I have (for my olive oil) is much better quality and I’d rather have one the same. For ages I didn’t use one – amazing how much oil I save now I do! Thanks so much for your comment Sue-lee! Great article. I follow you on IG but I can’t believe I’ve never been for a visit to your blog!!! (btw I’m etellinemma on IG). ‘Tipsy’ sounds like a great company, with a great idea but still willing to listen to others input. I’m in the french alps where bulk stores do not exist (yet…), we have a fairly local organic supermarket with basic bulk items – pasta, rice, sugar, cookies, nuts etc (they provide paper bags and encourage people to reuse them), and another non organic store who only provide plastic bags and single use containers, I asked them if I could bring my own bags and jars and they said No, so I don’t shop there any more. I recently asked a the farmers market if they would mind if I brought my own containers and was met with yes from everyone, one guy said he though it was a great idea and was going to put up a sign asking other customers to do likewise. But it doesn’t seem to be something that interests many people here (Chamonix), It’s a tourist town and my husband thinks that it’s just because people are on holiday and they can’t be bothered to bring their own bags and jars…but I’m not convinced. The plastic free movement seems to be gaining much more amplitude overseas than on my little bit of the globe. Recently had a chat with a friend (Canadian) about opening a bulk plastic free co-operative…but I’m the least business-minded person on the planet, don’t quite know where to start. So for the time being I am making changes in our family habits…with a lot of help from IG and bloggers! Thanks for sharing your wisdom. Thanks Emma. Wait…what?! I can’t believe that either! Hehe, just kidding. Nice to have you hear now. I love that you say “not yet” because we have to believe that things will change – and they will : ) Good on you for dumping the other shop – they sound rubbish! I thought about setting up a co-op when we moved because I wanted access to bulk stuff. But in the end, an awesome bulk store opened up here just before we moved, so I didn’t need to. To explore the idea, I would say chose products that you and friends use often, and start with that – buying one and sharing. It will allow you time to find out where companies are, how it works, how much you’d need and how easy it is, and then you can take it from there if you want to. Hope that helps! Thanks for popping over and taking the time to comment! Well, sorry to say that there are no olive trees growing here in Scotland. I’m happy to buy the Honest Toil brand and inspired by your post, am going to ask my local deli (who are happy to fill my jars with cheese/sundrieds etc) if they could offer it in bulk. So thanks for the nudge! Hi Katy, well I’m sorry too ; ) Go you – that would be so awesome if they said yes! And it never hurts to ask. Please let me know how it goes! This is my first “Plastic Free July” also and I, too find it kind of difficult. I almost feel like I’m not doing anything about it. I have my own handmade produce bags and shopping bags but I still bring too much plastic home from grocery stores. But I pay a lot more attention to the plastic around me, and I choose loose produce over the packaged ones. And I learn: yesterday I bought a kilo of mung beans (to sprout them) in a plastic bag and when I got home I remembered I could’ve gotten them in cardboard boxes from another store. I was bummed but then I realized that this is how I learn, from my mistakes. I do admit that I tend to buy some loose/bulk products, not because I need them but because they come plastic-free. Which is not very good either. But I’ll learn. Hi Raisa and thank you for your comment! Remember – all things are difficult before they are easy, and the important thing is that you have started! Simply reducing the plastic you bring home via reusable bags is a great first step. At the start, you’ll have lots of moments like your mung bean moment – I remember I did! The amount of times I purchased something in a box, only to get home and find sneaky plastic inside…grrr! But you are exactly right – we learn from our mistakes! Next time you’ll remember! I found that over time I shifted the kinds of meals I cooked around what was plastic-free. Not so much consciously, but it just happened. I found it really easy to buy oats plastic-free, so we started eating porridge, and baking more flapjack/cereal bar type things. It’s a great way to try out new recipes – but it all takes time! These sound like good folks, and your tips will make their business even better. Once again, you are so my inspiration! I love you’re thinking! I just wish my country was more in south… But because of our winter, even spring are so cold… There is a lot of thing we can not cultivate. I am thinking about translating my small blog to be able to share you’re post with my english speaker friends. We don’t produce olive oil in Canada, but we have Canola oil. I know it is not the same, not even same properties. But it’s local, and most of people here don’t even know that. I love the way you are telling things, you do not make people feeling miserable not doing enough, you just mention what they could do to make it better, and this is great! Haha, thank you! ; ) I don’t know if any country has perfect weather though! Here it is not cold enough for me to grow apples or parsnips and I miss them! I think it is important to shop local where we can, and if I had canola oil local to me, I would use it. My plan is definitely not to make anyone miserable! Change is hard enough as it is, and I do not think making people miserable will help at all! Thank you so much for your kind words! Such an encouraging post! I just can’t unsee all of this waste now that I think about it all sitting in a landfill for thousands of years. It can be really disheartening to go to the store and still have to buy packaged products because you haven’t been able to find an unpackaged or less packaged option locally. It’s a good reminder to focus on the progress I have made and to not be afraid to ask questions because just because something not available now, doesn’t mean it can’t be in the future. One of the most disheartening things I’ve found so far is that my local farmers market doesn’t actually have a lot of farmers! I’m going to try and visit a few further away and try back at the close one during different times of the year incase the selection is better. I do have a great local produce shop that does have some package free produce options but there are still a few things that I would love to buy that they only offer on a Styrofoam tray. :( I just bring my reusable produce bags and don’t purchase those items. Thank you so much Stephanie! I know exactly what you mean – once we see it, we can’t “un-see” it! Try not to feel disheartened – focus on what you have changed and how far you’ve come! I have definitely noticed what is available to me increase significantly over the last four years – more and more people are getting on board with this and change is coming! Farmers’ Markets are a bit of trial and error, I think. It is worth investigating and finding out which ones are better, and which times of year are better too. I used to live close to a long-established and awesome farmers market, but now we’ve moved out local one (which is very new) only has a handful of stalls. There are only 2 veggie stands – most of the rest is ready-made stuff like bagels, brownies etc that I would prefer to make rather than buy. I need to check out the other ones close to me. I carry a small fold-into-its-own-pocket shopping bag in my purse. the purse is a large cloth hobo style which I also use for small items. for grocery shopping I have sturdy, washable cloth bags with an outside pocket which contains cloth produce and bulk item bags. for the plastic I haven’t avoided, I am slowly making a multi-layer tarp by ironing sections together between layers of parchment paper. this is reinforced with the mesh that bags of citrus, onions, etc. come in. we have some mis-guided health regulations here that don’t allow some vendors to take my containers over the counter to fill for me. I mostly look confident and hand over the containers after I have given my order and it mostly works. i can recycle block styrofoam here, but not the food tray type. I occasionally end up with a foam tray and so far have been able to re-use them by cutting them into insulators for around light switch boxes. on exterior walls there is often a gap in the insulation sufficient that I can feel air move thru the switch boxes. a product is made to fill those gaps out of—flat Styrofoam. so, that’s a 2-for-1. You sound so prepared! I love it! And very resourceful – even better! I’ve heard about rules like that and I am so glad we don’t have them here. That must be super frustrating – I’m glad that you’ve been able to get around it. There is definitely something to be said for looking confident! We can recycle block (expanded) polystyrene too (but only if you’re prepared to take it to the place that processes it) and not the trays. Fortunately here they are easy to avoid. I love how resourceful you are with things! I really think it is important to shop local, where we can. I would definitely not recommend you choosing this company from over there! But you will have great solutions over there that I will be jealous of (!) and love hearing about, and they will inspire me to find companies here who will adopt those ideas too. Let’s share ideas and make them local! Agree wholeheartedly with your theme It’s not about perfect. It’s about doing what we can. On this my first plastic free July, I’ve been surprised not be the challenge of being plastic free which I’m managing quite well but the spillover to challenge other dimensions like questioning the food I eat – locally grown fruit and veges, things like dried chickpeas from the Kimberley not tinned Italian ones, wondering why even dried lentils have to come from overseas, asking a restaurant where their bluefin tuna came from – they didn’t know, finding a better grocery shop, not to mention other things like re-considering transport options etc. Am now wondering where I can get better bulk foods in Perth (near the city). An interesting aspect has been the conversations I’ve had. I’ve noted frequent tinges of guilt by people who agree they should do better but for whatever reasons don’t. It isn’t a contest or chance to be superior, it is about doing what we can. BTW I’m having an afternoon tea on Sunday with friends who have joined me in doing PFJ so looking forward to sharing stories and the challenges. Thanks Joe! I can totally relate to your experience too – on my first Plastic Free July I felt like I’d opened a can of worms! I started asking questions about everything. I’d taken so much stuff for granted and now I wanted to know the “why” of every choice I made! I wonder if this guilt these people feel is the first step towards changing?! (I think it might be!) Sometimes it is easy to say it is too hard, but when we know someone who is making the changes, it is less hard to say that. Hopefully you will inspire some positive actions! Good luck with the afternoon tea – I’d so love to hear how it goes so please keep me posted! Thank you. Thank you for being honest and to the point. For not getting caught up in the concept of more and throwing more products our way. Thanks for not continuing to add. So very refreshing and so much appreciated. Yes! Our bulk store has not had bulk olive oil for several years (due to lack of interest from everyone besides me, I guess:), and olives are not grown in our area, so I would love to see an option like this. It can be frustrating when you can’t find the options you want locally. I love also that you don’t advertise. It shows how keen you really are to practice what you preach, thanks! I made a pretty darned good toothpaste, laundry detergent and shampoo bar this week to add to my products I don’t have to purchase individually. Thanks for your encouraging blog! Thanks Susan! I think for me, it would dilute my message. Less is more, and use what you have, pretty much! ; ) I’ve never thought about that with the signs. But what should they use instead – not plastic?! Woah, go you – that is awesome Susan! What did you put in the shampoo bar? I still haven’t got round to making soap. I’m lucky that there is a great and affordable place to buy soap locally, but I do think it’s a life skill that I’d love to know more about! You’re amazing! I really admire your honesty. I use reusable bags for produce at grocery stores and the woman who was ringing up my items made a comment on them and how amazing she thought they were – she even said she wanted to get them herself. It’s the little things! Wonderful that you got to share ideas with them (and I had no clue that there were olives grown in Australia). It takes me so long to use a bottle of oil that I now wonder if (mega-corporation) Whole Foods or (local store) Life Grocery might have it in bulk since last I looked. Thanks for the inspiration, and, I’m green with envy over your local olive crop. Hello. So far it has become clear that its worst in the supermarkets; I am coming out ‘guilty’ or with very little! On our little market, where I can buy fresh bread and loose fruit and veg, I bought a slice of pie and it was placed in a card container that looked just like those styrofoam burger boxes so there is some hope. A few years ago in Arizona, the Wholefoods supermarket had cellophane style sandwich boxes etc. made from corn starch so not plastic at all. I wonder why these are not more available? Not that I buy readymade sandwiches usually but it could be used for other packaging. I am not convinced that we will ever succeed in removing all packaging so compostable materials would be good to support. thanks for publicising this and inspiring people. I’ve been doing it since the 80s! ps I have 2 shopping bags made of strong cotton that I bought in the US in 1987 and ’89. They are still going strong having been used continuously. I replaced the handles on one of them. Is this a record? Thanks so much for your comment Carol! I agree, the supermarkets love their packaging. I found over time I shopped there less and less until I barely went there at all. I think more places are offering truly biodegradable and compostable alternatives like cardboard (I’m not a fan of bioplastic at all) which is better, but it’s still a lot of resources for a single-use throwaway item. I agree that we’ll never remove all packaging, but I think we can limit it. For examples, cafes shouldn’t use it for people who dine in! PS yes I think that is an actual record Carol! Love it! May they last many more years! do you think bamboo sponges are as natural as they say them to be? http://guide.alibaba.com/shop/anti-greasy-color-dish-cleaning-sponge-pad-bamboo-fiber-dish-wash-sponge-foam-magic-kitchen-cleaning-sponge-pad-rags_7304589.html I sort of doubt since they are all these weird colors, but you can wash dishes without any dish soap and they last about 6 months. What do you think? Hi Gayla, oooh I wouldn’t trust them at all! Firstly the colours, plus it doesn’t specify if it’s just the outer or the whole thing that’s bamboo. Plus making fabric from bamboo can be really chemical intensive so I think if it’s not organic and produced by an ethical/reputable company it’s better avoiding! Do you think they’d actually work and live up to that claim?! I thinki you are right.. I don’t mean to speak down about other nations, but when it comes to China I don’t have a lot of trust in their lables or claims. With the plastic bags I get at the supermarket I save them up, and re-cycle them to a local charity store, who are very grateful for the bags, so they do get a 2nd turn around at the shopping. I am hopeless at remembering to take bags with me, or never have enough when I do! Perhaps that is my starting point to make a change! This is my first Plastic Free July and I have definitely met a few frustrations along the way. Such as, I needed to get some nuts to bake a cake for a coworker and the only local bulk stores that sells them outright REFUSES people to bring in their own containers. (I called ahead and asked.) I was annoyed but still went to buy the nuts anyways. Thankfully I had to get only a small plastic bag the size of my hand but more frustration ensued at the self-checkout when I realized I’d forgotten my cloth bags. Not to fear, I thought, they had paper bags and I could definitely reuse the paper for gift wrapping. Then the machine started malfunctioning because it didn’t want to accept the fact that I had a paper bag so an attendant came over and starting grumbling at me about how I “should’ve just used a plastic bag.” Any polite words to her were completely drowned out by her unhappiness. Eesh, there’s a reason I only go to that store once a year or so. Everyone is just so unfriendly! The biggest thing I am working on is eating locally which can be a little difficult, price-wise. I went to two different stores that source nearly all of their foods locally and each one had organic red bell peppers for $3.49 (USD) each which, for me, is A LOT. I could buy a pound of beans, a pound of rice, and a bunch of cilantro with that money and have lunch for a week (albeit it isn’t the tastiest) instead of one bell pepper that’ll last me just one day. Also, I went to our local farmer’s market and there was nearly nothing there. I was quite disappointed. Less than five vendors and only one sold fresh fruit. The rest sold baked sweets or things they had crafted. One step at a time though. I am certain I’ll figure all of this out.